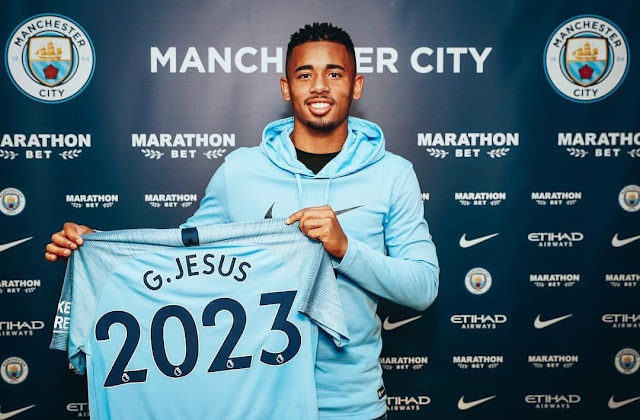 Brazillian striker Gabriel Jesus has signed a new 5-year deal with Premier League champions Man city which will see him at the Etihad till 2023. The 21-year old striker arrived at Manchester City from Brazilian club Palmeiras for £27m in January 2017 and netted seven goals in 11 matches in his debut season. He scored 17 goals as Manchester City won the Premier League and the Carabao Cup last season. He has struggled with injury at the Etihad, breaking a metatarsal in his foot and suffering a knee injury. Gabriel Jesus described joining the Manchester club as the "best decision I've made in my life". Manchester City play last season's FA Cup champions Chelsea in the Community Shield on Sunday (3pm kick-off).